Interfacing, a pioneer in Business Process Management (BPM) and Governance Solutions, announces its client, ‘us‘ – Utility Services, won GOLD within this year’s Global Excellence in BPM and Workflow Awards for the Pacific Rim. ‘us‘ – Utility Services is a water management program alliance between South East Water, Thiess Services, and Siemens. The award recognizes an organization that has clearly demonstrated excellence in their implementation of innovative business process solutions to meet business objectives. Our value streams are highly complex, so the ability to easily manage the interactions and visualize the hand-offs across departments allowed us to improve processes across 3 major organizational entities. Results have been achieved, but our excellence program is continuous, so we are glad to have Interfacing on board as a strategic BPM solutions partner. In 2009, the ‘us’ IT strategic plan identified an opportunity to gain extra business value through a process-driven focus to service delivery; this opportunity was met through the BPM program. A BPM working party (akin to a CoE) was established and a number of BPM initiatives were undertaken. The organisation leveraged Interfacing Enterprise Process Centre® (EPC) to document, manage and communicate process information across the Alliance. The results already achieved are extremely significant, both financially and culturally. ‘us’ – Utility Services now has well defined responsibilities and the organisation has experienced an overall culture shift, as managers have accepted process ownership for on-going review and improvement. ‘us’ – Utility Services is a strategic alliance between three parties: South East Water, Thiess & Siemens. These three organizations combine their network of capabilities, knowhow and innovative skills to deliver exceptional operations, maintenance and construction services to their key customer South East Water. This unique mix makes it also possible to share competencies, technologies and innovative solutions with other utilities, councils and industrial customers. South East Water Limited provide water and sewerage services to nearly 600,000 residential, industrial and commercial properties in an area covering 3,640 square kilometres in the eastern part of Melbourne, Australia. South East Water manages infrastructure and assets with a net book value in excess of $1.3 billion and is responsible for 8336KM of water mains, 7724KM of sewer pipes, 78 water pump stations, 237 sewer pump stations and 9 sewer treatment plants that serve 1.3M people. 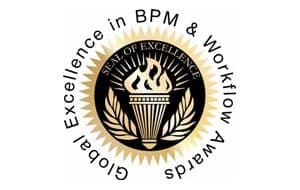 The annual Global Excellence Awards in BPM and Workflow awards, now in their 17th year, are presented to user organizations that implemented business process management projects that stand on their own in terms of excellence, lessons learnt, and demonstrable benefits that go beyond organizations’ boundaries to reach out to end users. BPMFocus.org and BPM.com jointly sponsor the Awards with support from industry associations Workflow Management Coalition (WfMC) and Object Management Group (OMG). The Awards program is managed by Future Strategies Inc., publisher of unique books and papers on BPM and Workflow.